Two years ago I found Geum ×catlingii in Cortland, New York. Since then I have seen this hybrid is several other counties including Cayuga, Chemung, Onondaga, Tompkins, and Tioga. 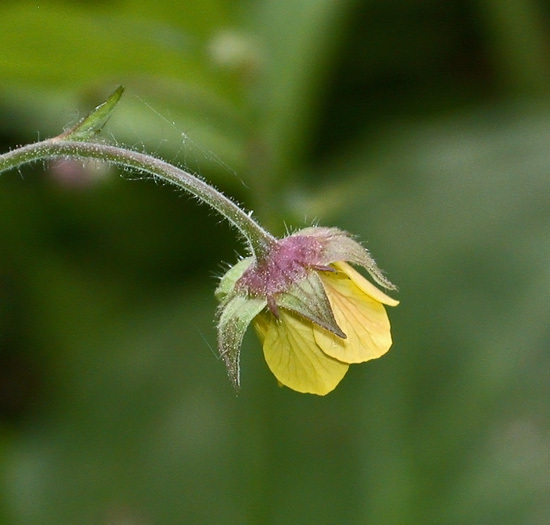 It is a hybrid of Geum canadense and G. urbanum. 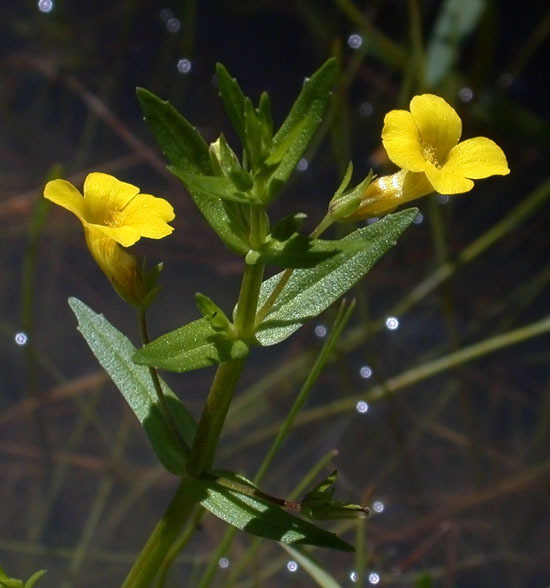 It is fairly easy to identify for its pale yellow flowers and large stipules. 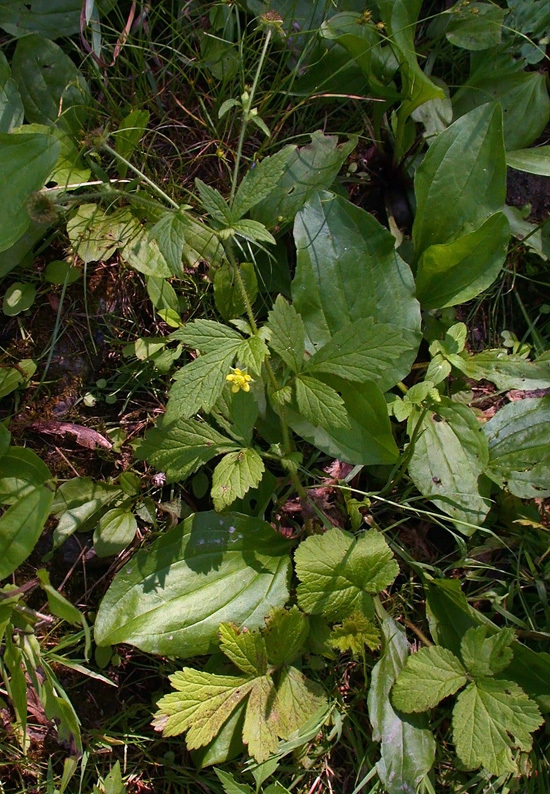 It otherwise looks like G. canadense but is mostly sterile. 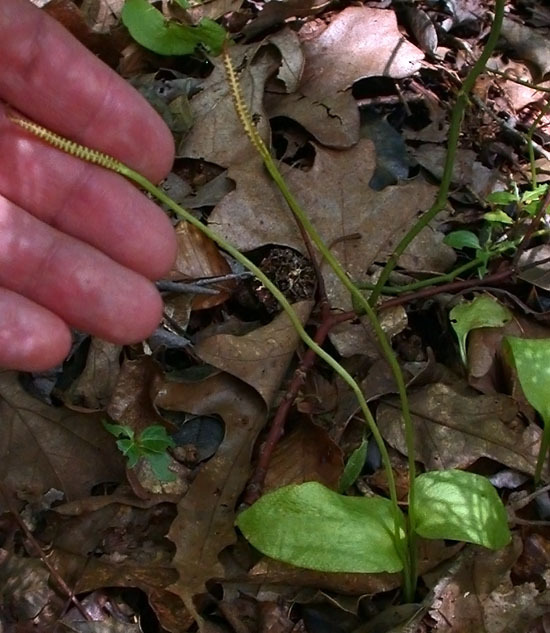 Lower leaves showing large stipules and rather hairy stem. 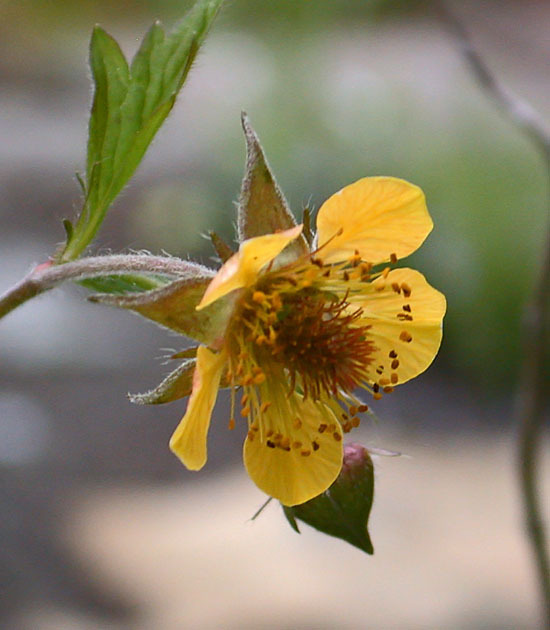 Earlier this year I found another Geum urbanum hybrid. 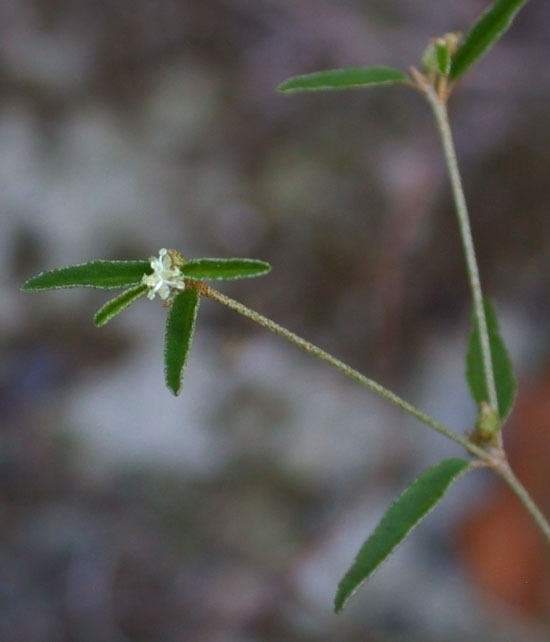 At the time I knew G. rivale was one of the parents but it took a second visit to the site and closer examination of the plants to determine the other parent as G. urbanum. This hybrid is named G. ×intermedium and until now was only reported from Europe. 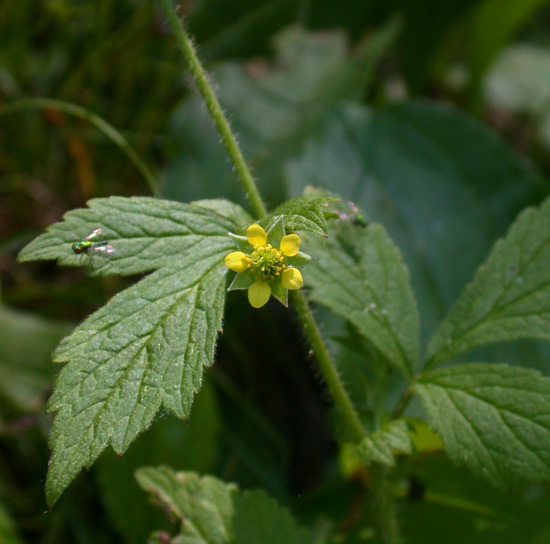 There was one other Geum hybrid that I was interested in finding this summer, G. ×macneillii which is the hybrid of G. laciniatum and G. urbanum. 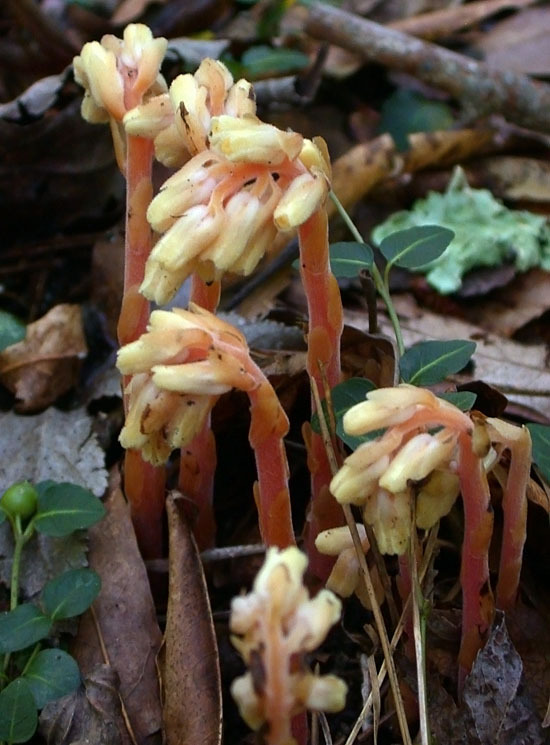 It was only known from Quebec, Canada and was described by the same authors who described G. ×catlingii. I set out to find a large population of G. laciniatum where G. urbanum was also common. A village park along a river floodplain turned out to the the perfect spot. 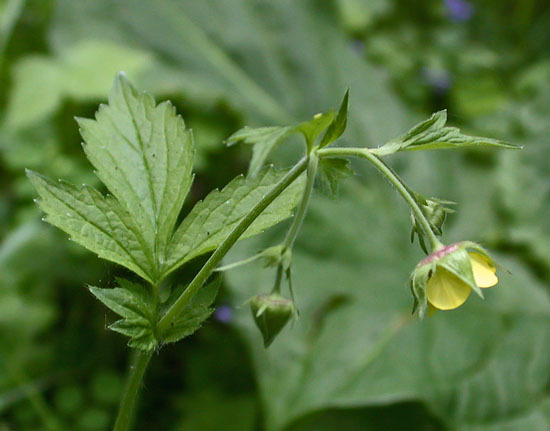 There were three plants total, two rather small in stature similar to G. urbanum and one larger plant closely resembling G. laciniatum. Both forms had a combination of features separating it from the parents. 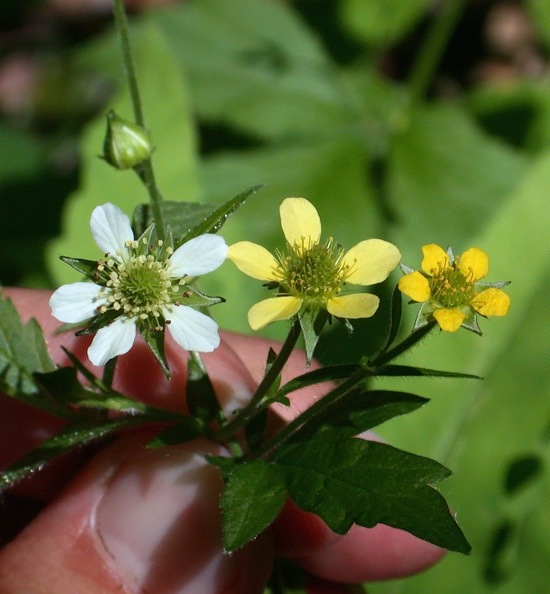 These included yellow flowers with petals shorter than the sepals, stiff deflexed hairs on the stem, relatively large stipules, and flowers with numerous carpels that were consistently sterile in all of the plants found. 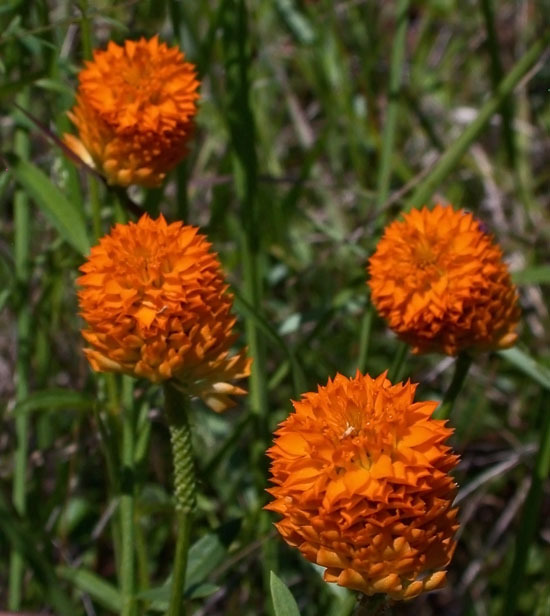 Overall habit of G. ×macneillii. 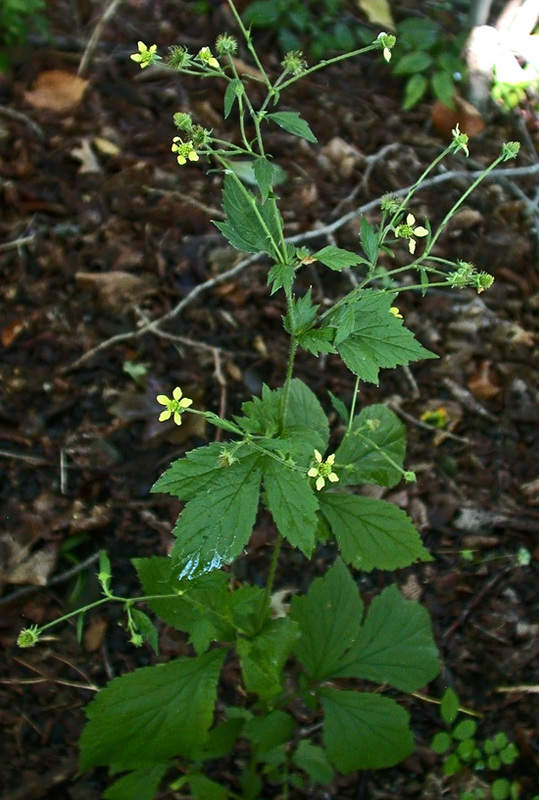 This is one of the smaller plants found. Hough, M. 2018. 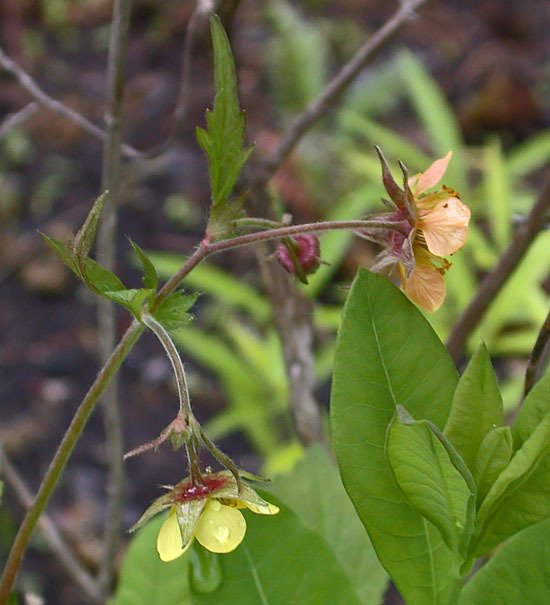 Geum ×cortlandicum (Rosaceae), a new natural hybrid plus three Geum urbanum hybrids new to the flora of New York. Phytoneuron 2018-59: 1–9. Head of achenes under the dissecting scope. Notice glands on the body of the achenes which occurs in some forms of G. canadense (typical of that species where these plants were found). There are also some hairs on the achenes. 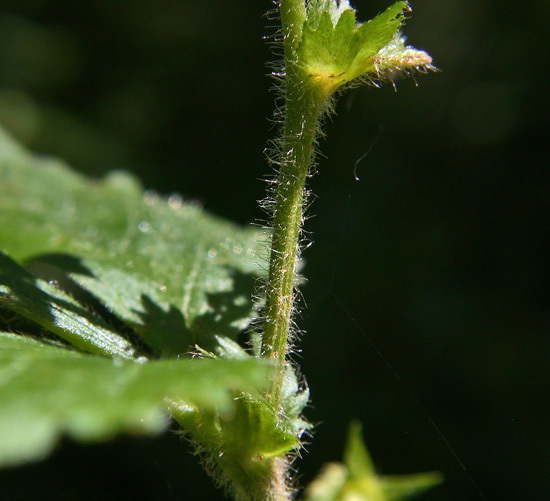 While there is a variety of G. laciniatum that has some hairs on the achenes (var. trichocarpum), G. laciniatum growing with these plants all had glabrous achenes. 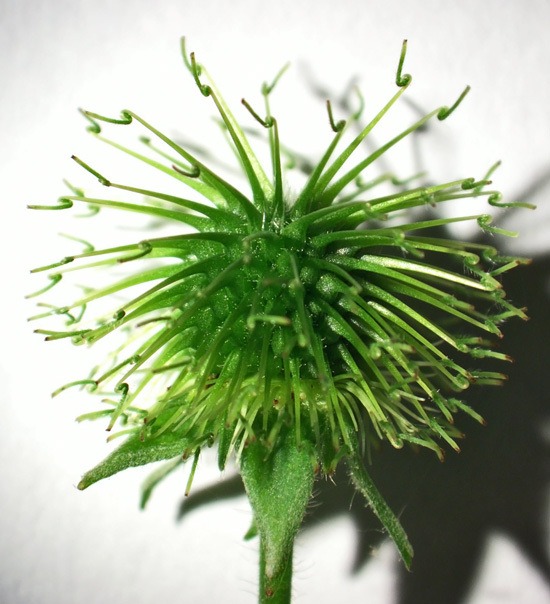 The fruiting receptacle with the achenes removed. 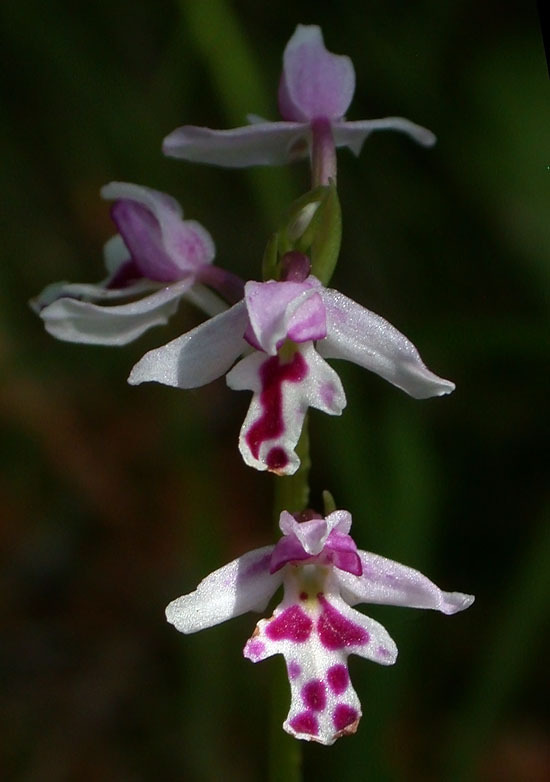 In G. laciniatum all but the tip and very base would be glabrous or have a few very short hairs. 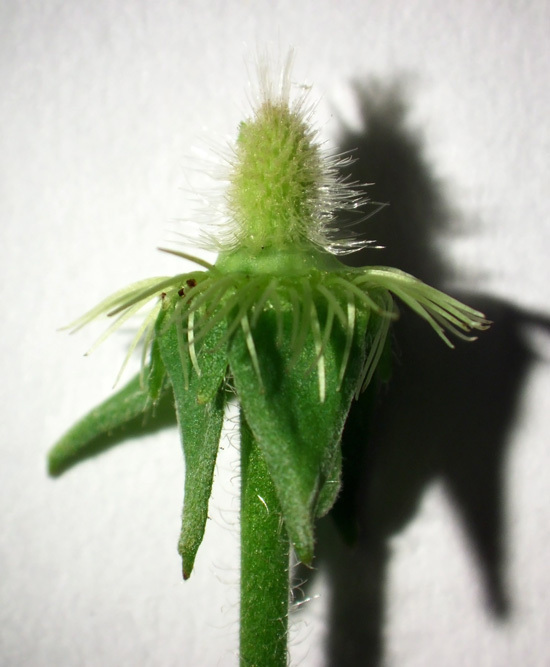 The hairs on this specimen are like those of G. canadense but are less dense. This is an important feature of the hybrid but should be considered together with the other features described. 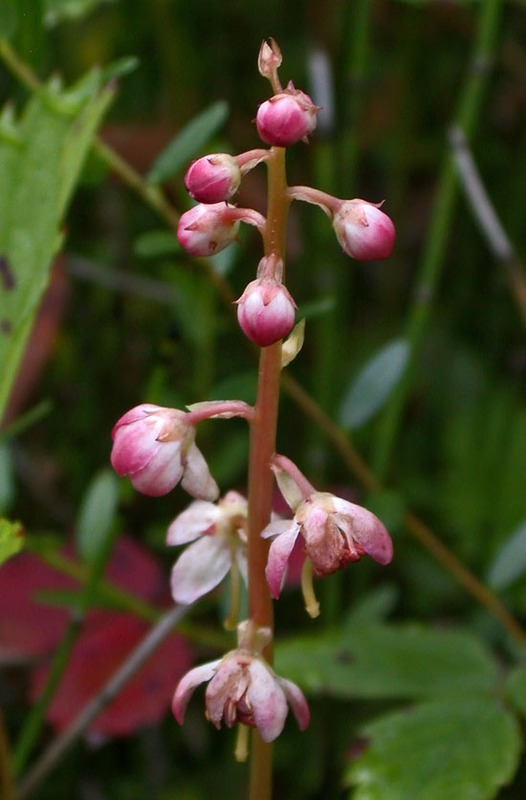 Five Pyrola spp. occur in New York. 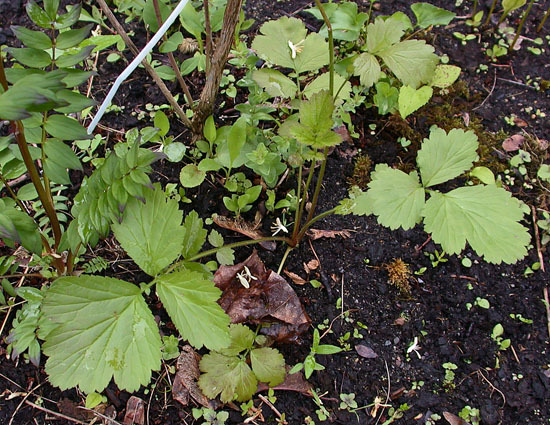 These plants are commonly known as wintergreen or shinleaf. I was able to photograph all but one of these in the last two days. The one that still alludes me is Pyrola chlorantha which, unlike the other species, has greenish flowers. It is not uncommon so I may still find it before the end of July. 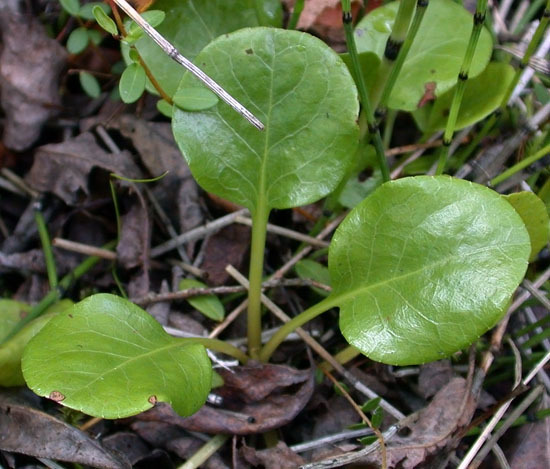 The most common species is elliptic-leaved shinleaf (Pyrola elliptica). This one was found under a young gray birch on an old iron mining site. 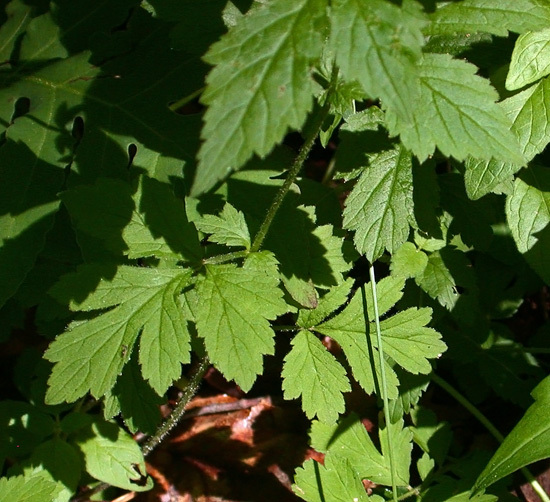 The leaves are often a darker green. Two days ago I found a large patch of American shinleaf (Pyrola americana) growing in moist sand along the edge of a bog. I’ve also found this species in swamps. 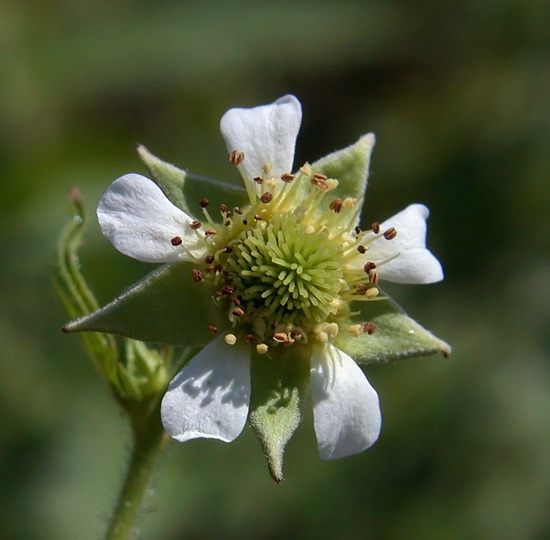 This is one of the largest species with round leaves and relatively large white-petaled flowers. 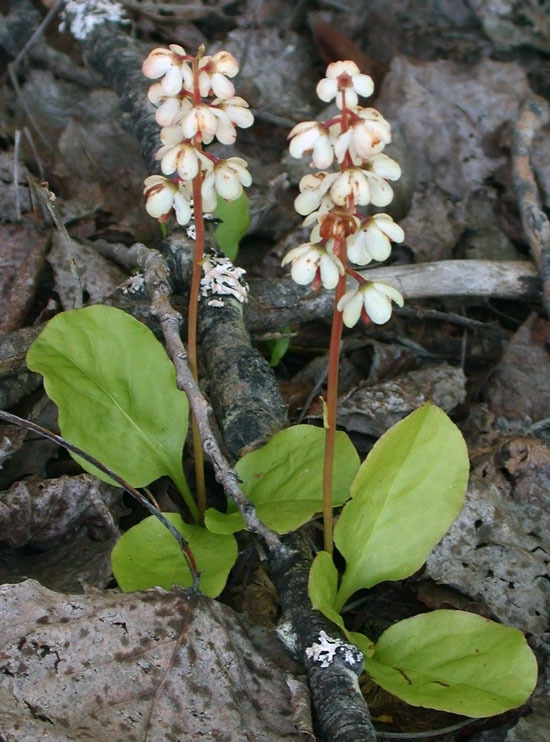 It is probably the most common species in New York other than Pyrola elliptica (and possibly P. chlorantha which I have ironically yet to find). 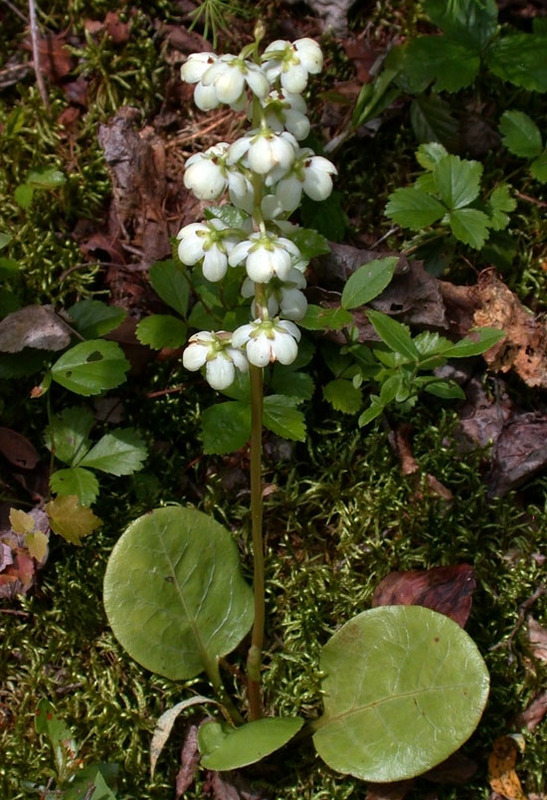 Back at the old iron mine site there was a good population of the state threatened pink wintergreen (Pyrola asarifolia) growing primarily in the shade of willows, tamarack, and black spruce. 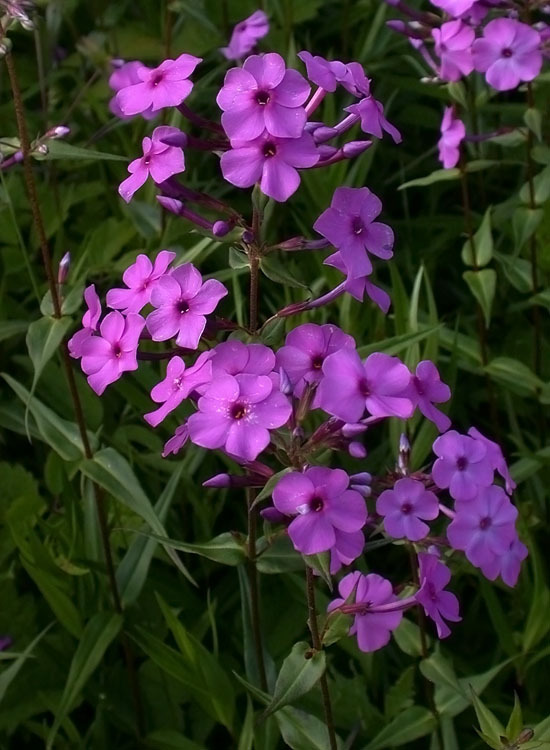 While the leaves resemble those of P. americana to some extent, this is the only species with consistently pink or pink-purple flowers. The petals of P. elliptica can sometimes have a faint pink hue but are mostly white and the thin (rather than shiny and leathery) leaves are quite different. Shiny, leathery, rather round leaves of P. asarifolia. 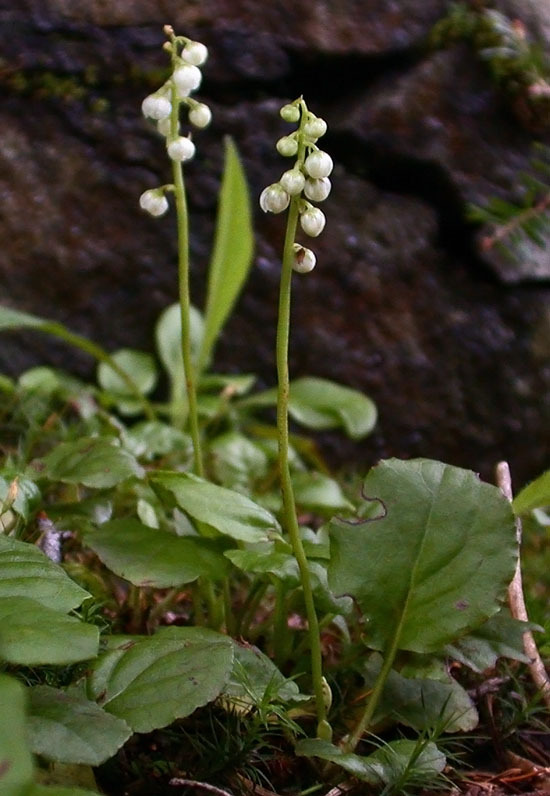 The rarest species in New York is the state endangered little shinleaf (Pyrola minor), known from just below the alpine zone of one high peak and one other nearby location. 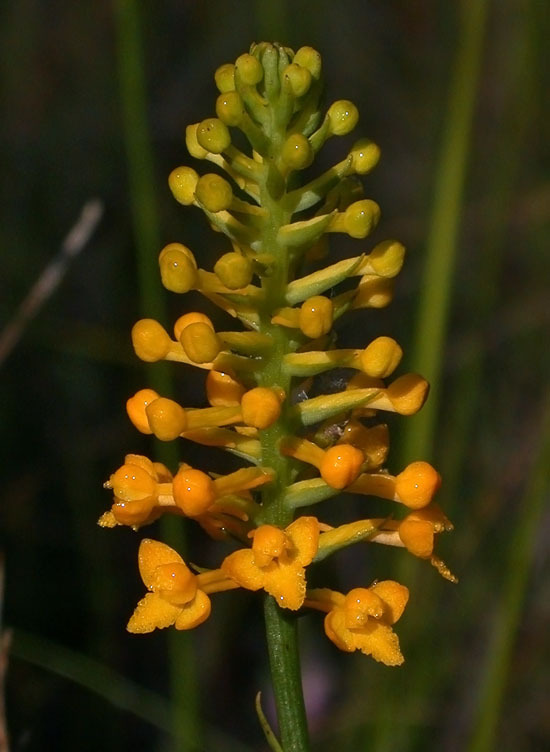 There are probably less than 100 known plants in the state, though careful searches in the area might turn up more. This species is primarily a boreal species that inhabits subalpine coniferous forests in New York. It is smaller than the other species and also differs in having a short and straight style. 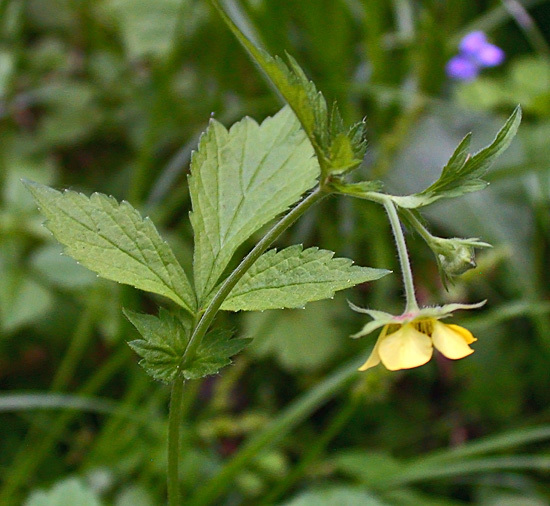 All other species in NY have an elongate and strongly curving style (not counting the segregate genera Moneses, with solitary flowers, and Orthilia with flowers all on one side of the raceme). Lots of orchids in bloom now in Central NY. The first batch are from a poor fen. 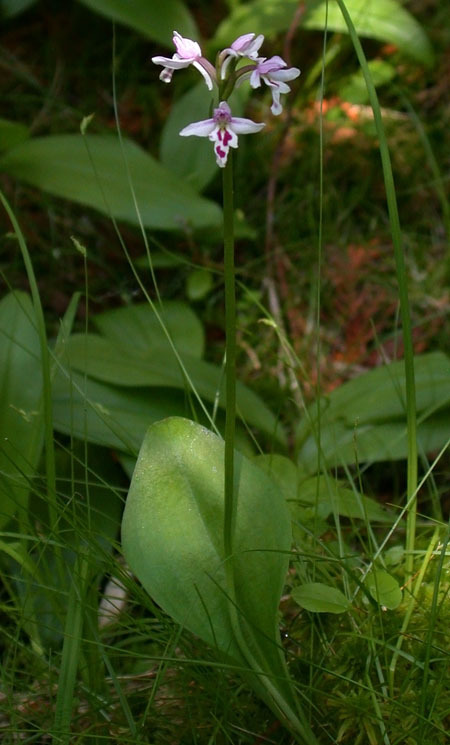 The pink orchids are rose pogonia (Pogonia ophioglossoides) growing with northern pitcher plant (Sarracenia purpurea), spoon-leaf sundrew (Drosera intermedia), and mud sedge (Carex limosa). 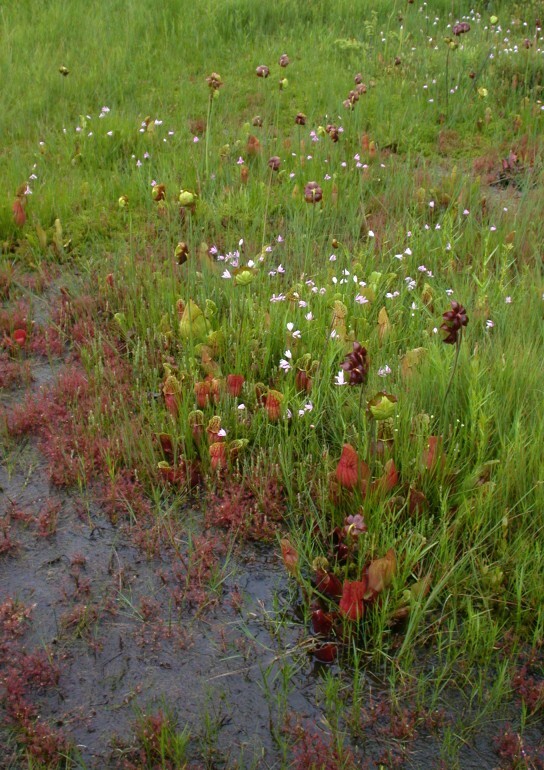 Scattered on the floating mat were grass pinks (Calopogon tuberosus). It was raining most of the day and this skipper was probably just seeking shelter on the petals. 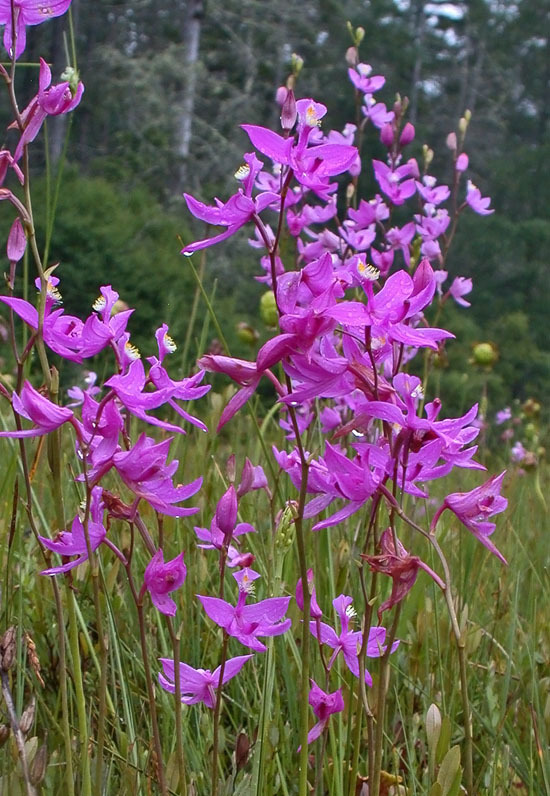 Some of the grass pinks were impressively large and exhibited considerable color variation. 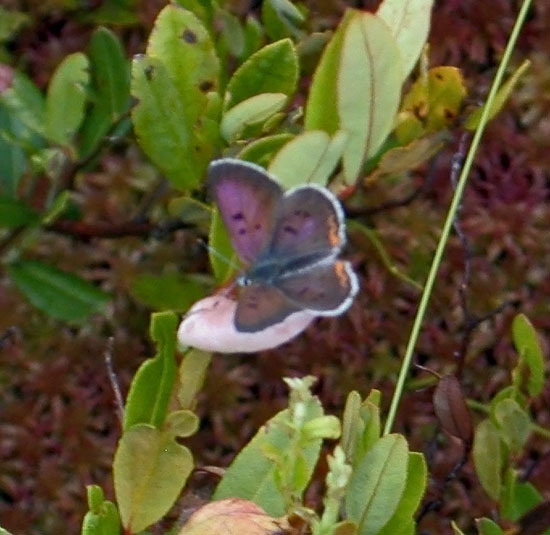 The sun came out just long enough for bog coppers (Lycaena epixanthe) to become active. 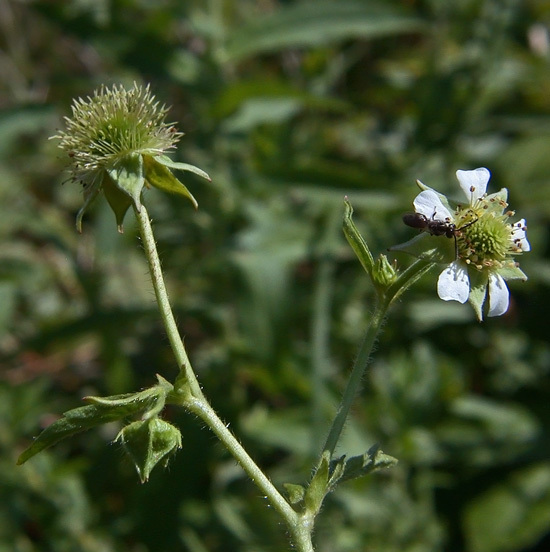 The larvae feed exclusively on large and small cranberries (Vaccinium macrocarpon and V. oxycoccos, respectively) and adults are usually found when these plants are flowering. 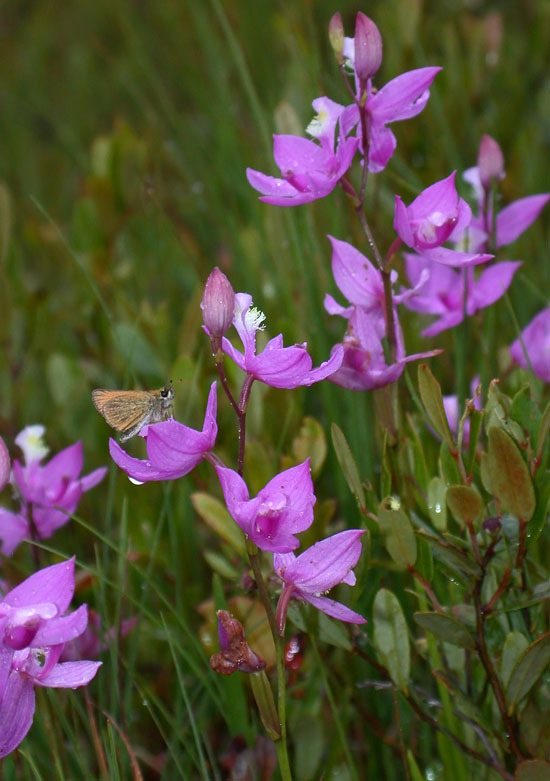 We also visited a wet meadow with a large population of northern tubercled rein orchids (Platanthera flava). 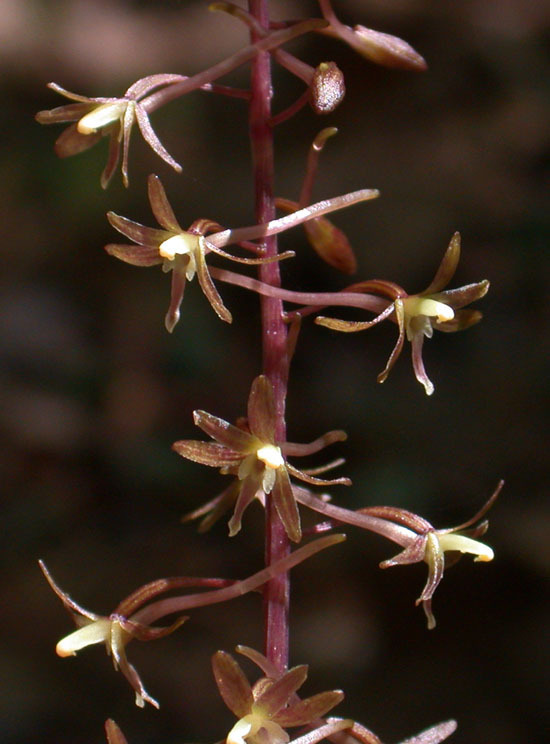 This species can be distinguished from similar ‘green’ orchids by the tubercle (bump) on the labellum (lip petal). 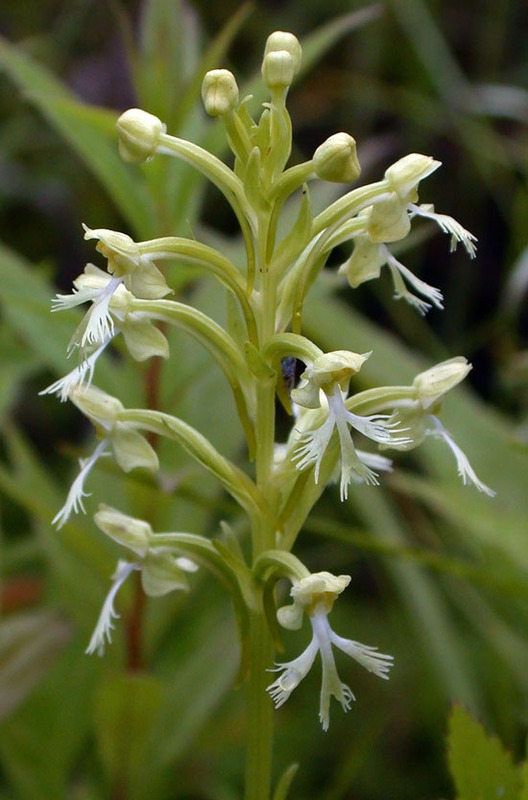 On a roadside nearby we found some ragged fringed orchids (Platanthera lacera). 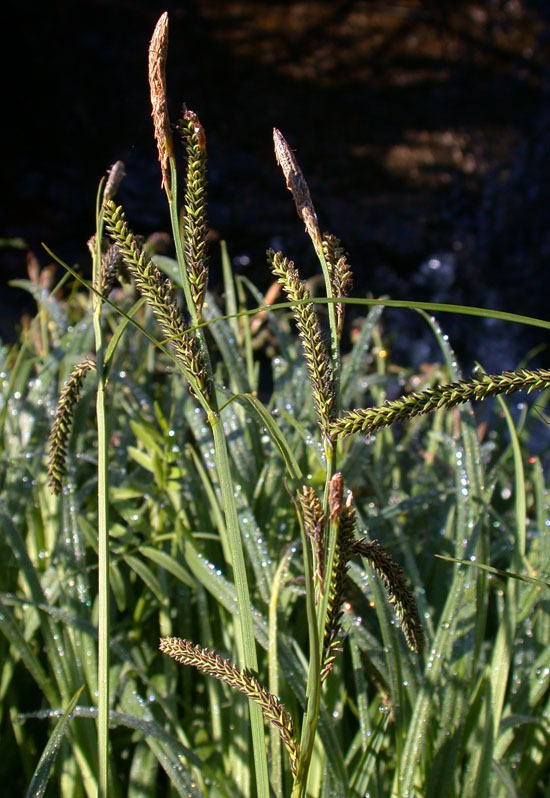 This species likes open, moist to wet fields and benefits from mowing early in the year to reduce competition. 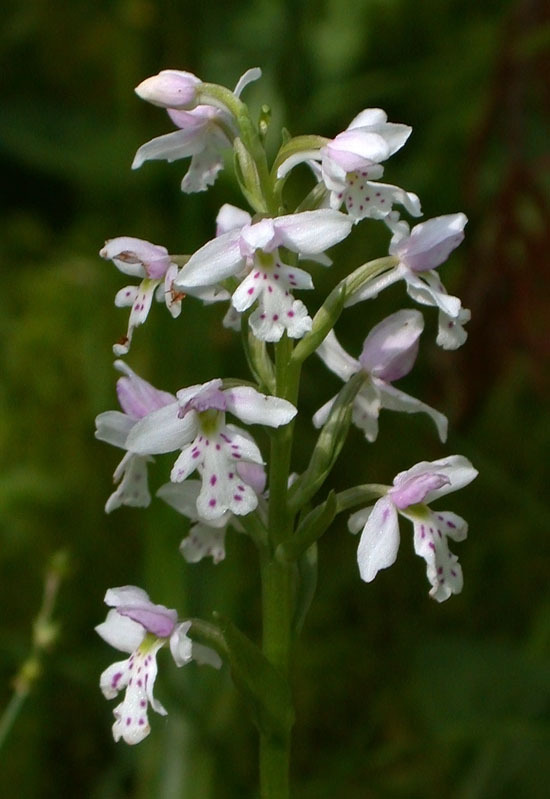 Greater purple fringed orchids (Platanthera grandiflora) are in full bloom now. This one was found in a swampy partly shaded edge of a rich fen. 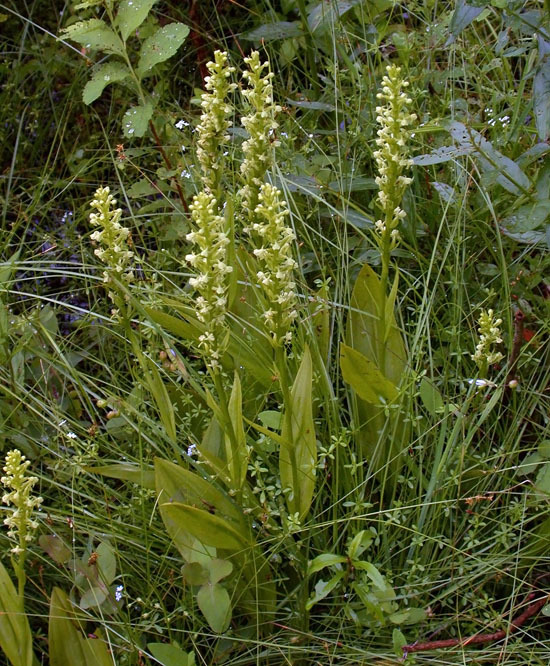 The similar lesser purple fringed orchid (Platanthera psycodes) usually blooms a couple weeks later and can be found in similar habitats. Some interesting plants seen today on the Tug Hill in Lewis County, NY. 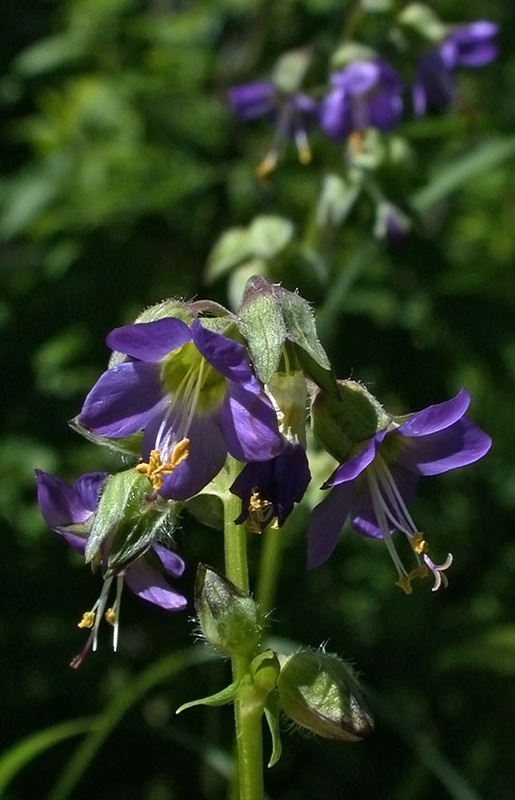 The first is bog Jacob’s-ladder (Polemonium vanbruntiae), a globally rare species found primarily in NY. 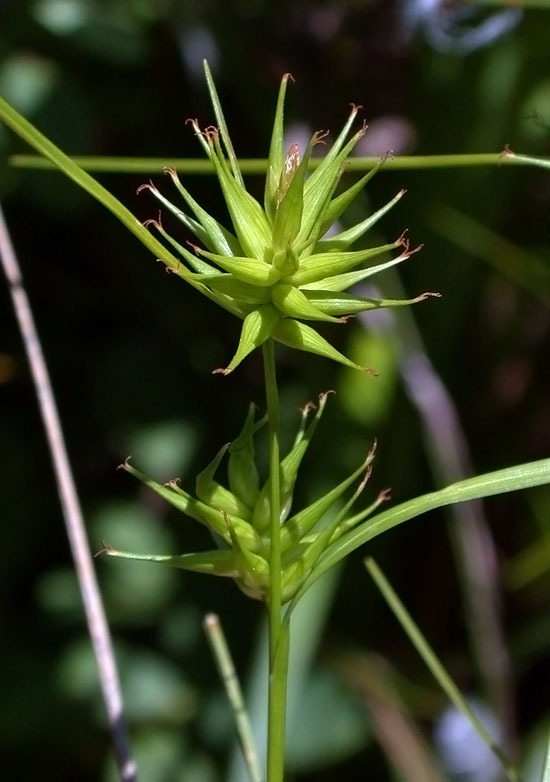 This was the first time that I have seen Michaux’s sedge (Carex michauxiana). Shiny lanceolate leaves and reddish spotted stems help distinguish wild sweet-william (Phlox maculata) from other Phlox spp. 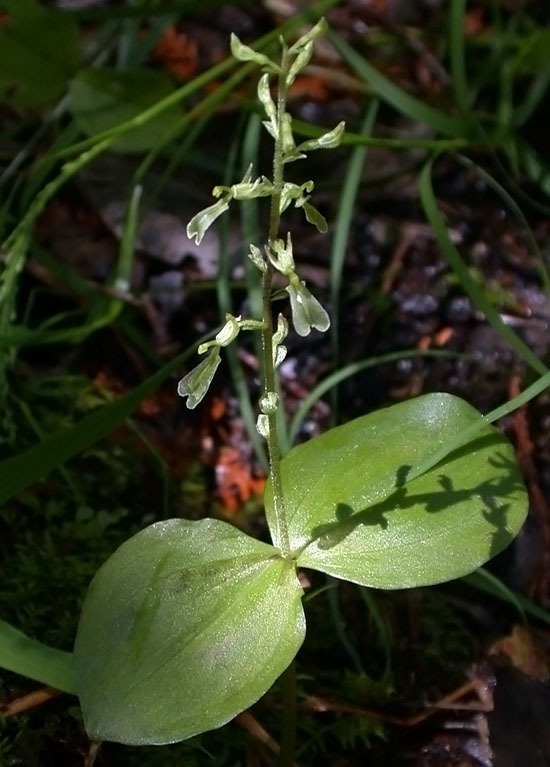 Broad-lipped Twayblade (Neottia convallarioides, formerly Listera convallarioides) occurs in northern white cedar swamps in NY. 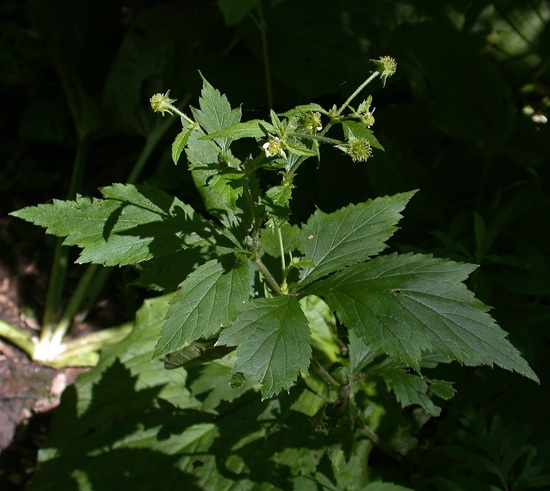 Though once known from several locations in upstate NY, the plant pictured here is from the only known extant population in the state. 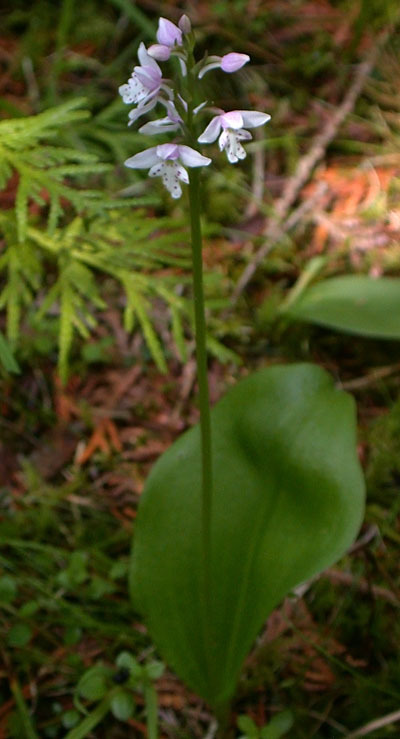 Round-leaved orchid (Amerorchis rotundifolia) once occurred in a few places in northern NY but is now considered to be extirpated. It is considered to be rare in most states where it still occurs. 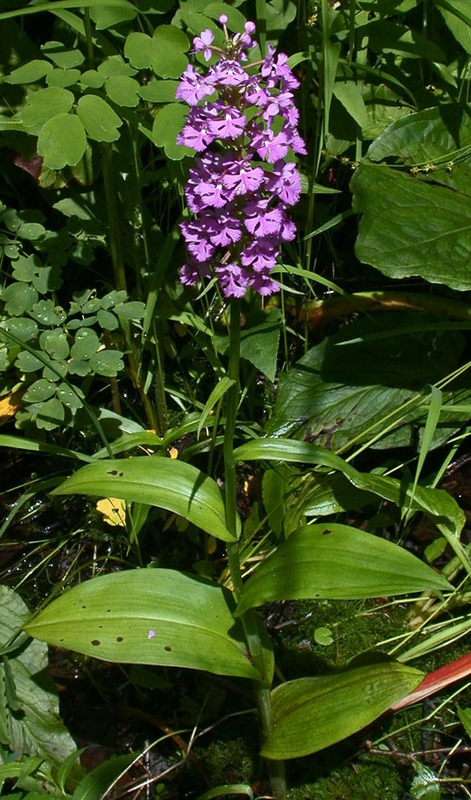 This orchid is primarily found in northern white cedar swamps. 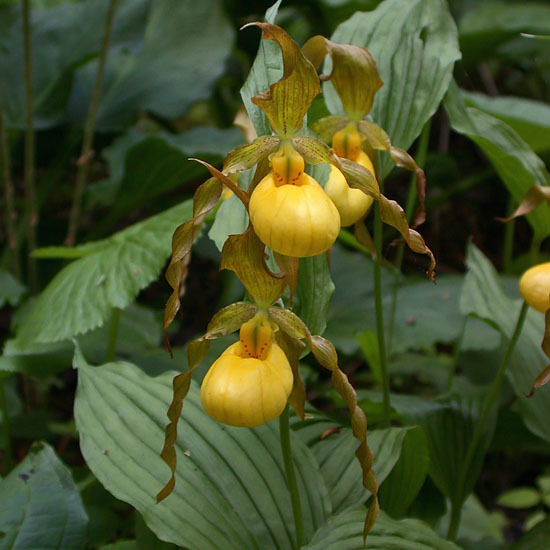 I joined a small group today on a trip to a cedar swamp in Canada where this orchid is still relatively common. 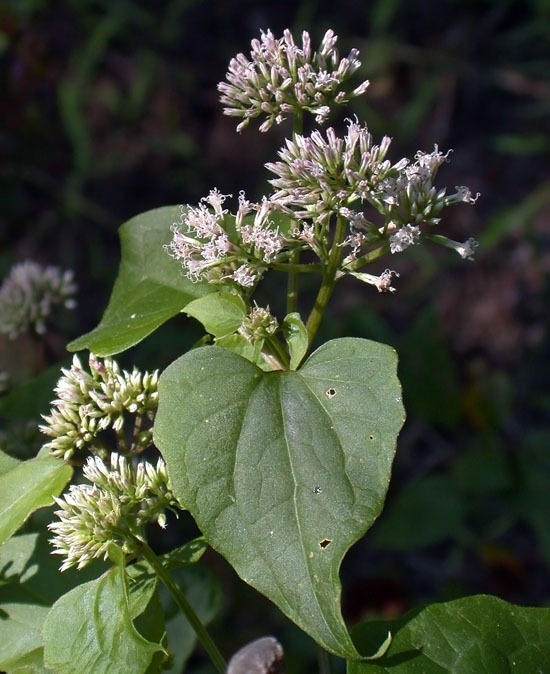 The flowers are pinkish white and typically have pink spots on the lip. 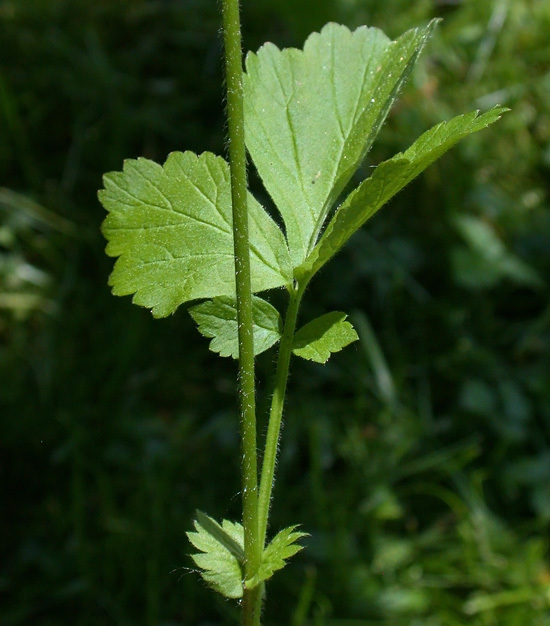 Plants have a single, round to oval basal leaf. A form with broad, longitudinal reddish lines on the lip has been called var. 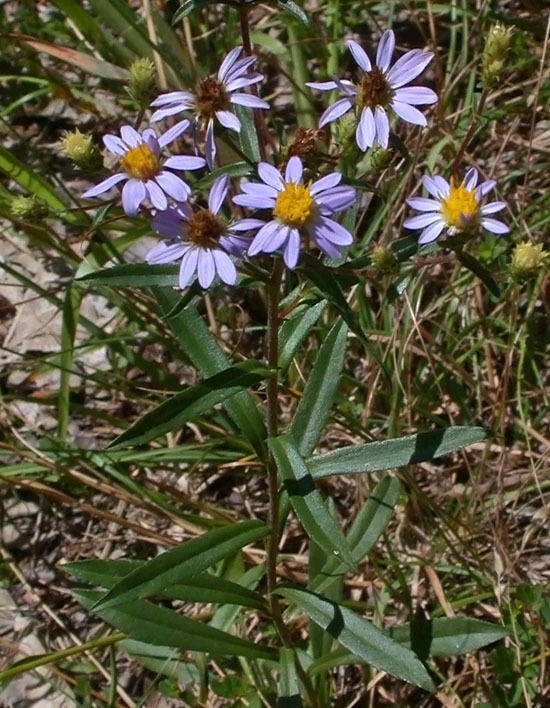 lineata and was found mixed with the more typical form. Closeup of the lined form. 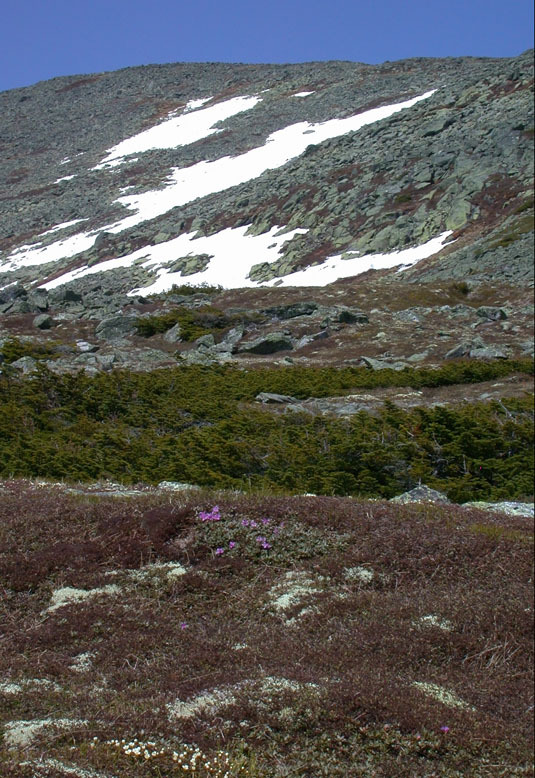 Yesterday I visited Mount Washington, NH to see several alpine plants in bloom. The auto road was originally scheduled to be closed for paving but fortunately the work was done early and they decided to open at 9:30 am. Even more fortunate, as I got there early, the road was opened a little after 8:30 am. While I was waiting for the road to open I took a walk around the visitor center. In a small rocky brook I found twisted sedge (Carex torta) which I had not seen before with mature perigynia. Notice the black-margined scales and somewhat dropping lower spike. 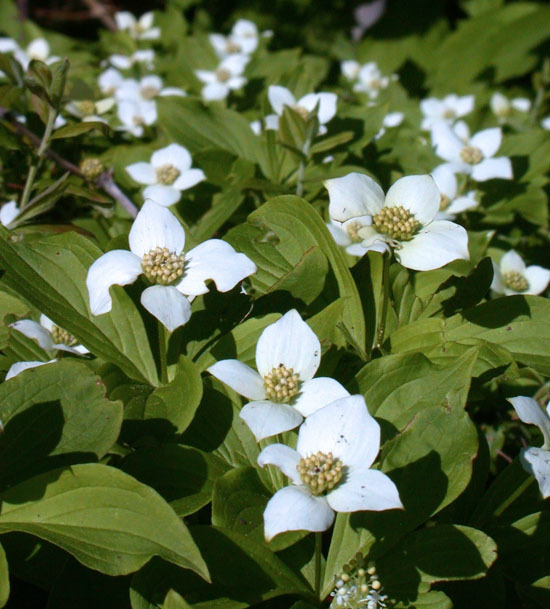 On a hillside meadow there was lots of bunchberry (Cornus canadensis) in bloom. Here in central NY bunchberry is not so common and rarely grows out in the open like this. 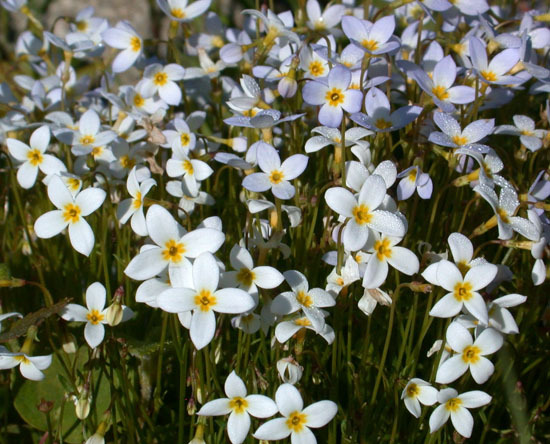 Little bluet (Houstonia caerulea) was also abundant. 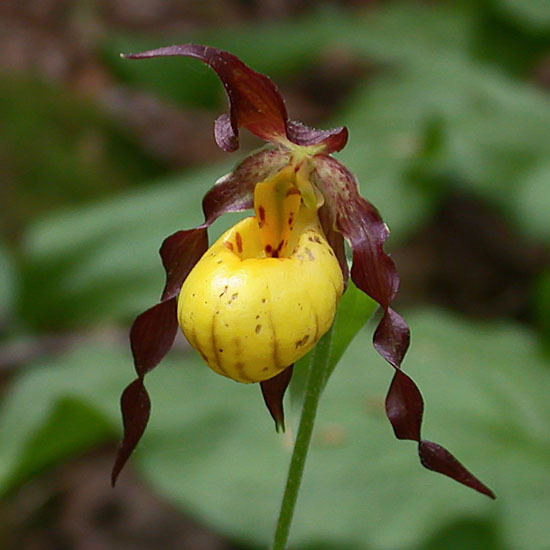 These could be seen everywhere from 2000′ elevation all the way up to the alpine zone, though they became less abundant further up the mountain. 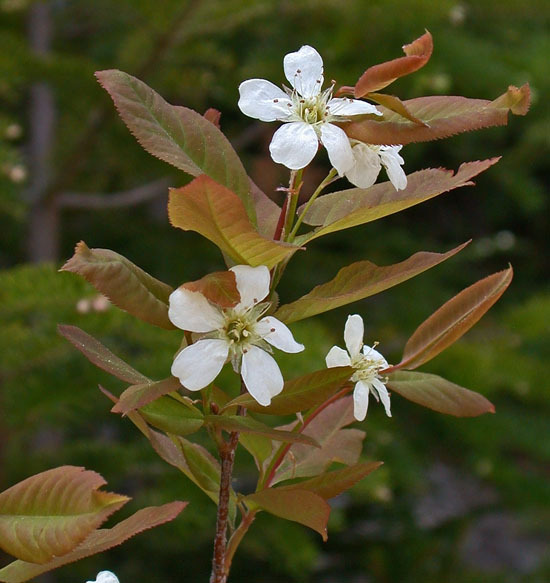 In a few spots along the roadside, including just below the summit, was mountain shadbush (Amelanchier bartramiana). Unlike most other Amelanchier spp. 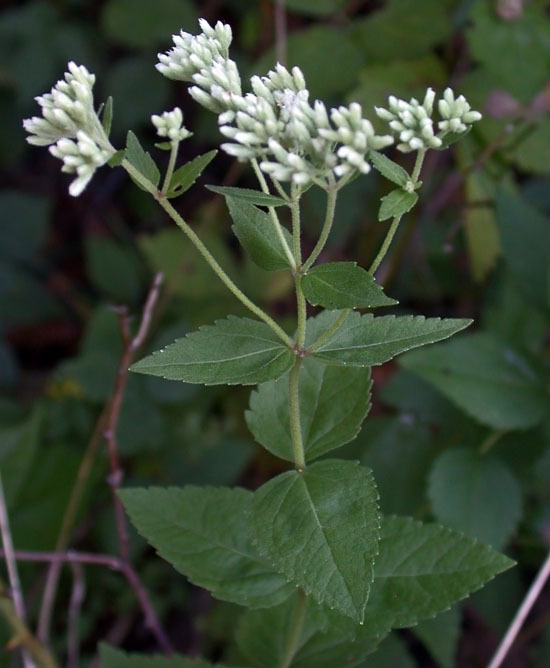 this one has nearly sessile leaves that taper towards the base and flowers borne singly or in few-flowered clusters. Before leaving the tree line I got the chance to see lots of mountain paper birch (Betula cordifolia). 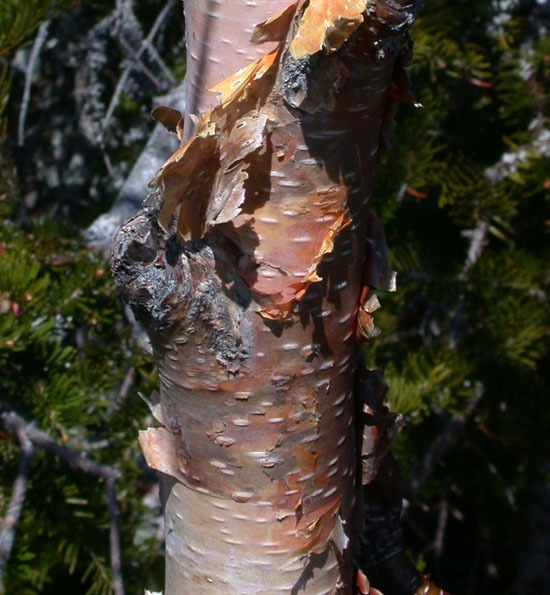 It is quite similar to, and used to be considered a variety of paper birch (Betula papyrifera). 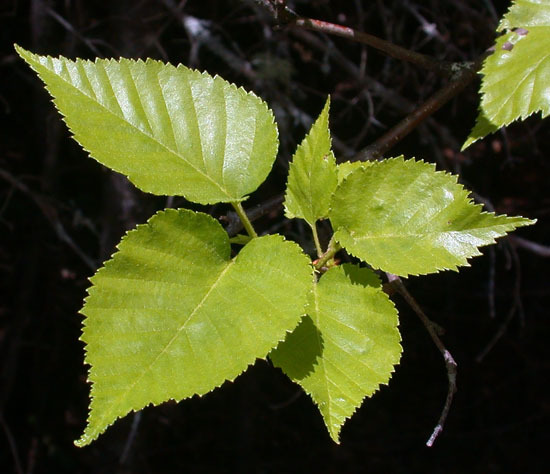 It differs from the latter in having leaves that are more or less cordate at the base and bark with a pinkish hue. Pinkish-brown peeling bark of heart-leaved paper birch. As the forest transitioned to krummholz (a zone of dwarfed, deformed trees) I started to find black crowberry (Empetrum nigrum) along the road. 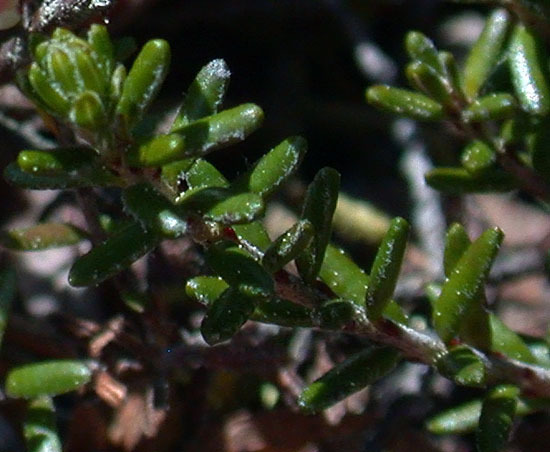 Close examination of several patches of crowberry turned up at least a little purple crowberry (Empetrum atropurpureum) which has twigs covered by white hairs unlike the smooth twigs of black crowberry. 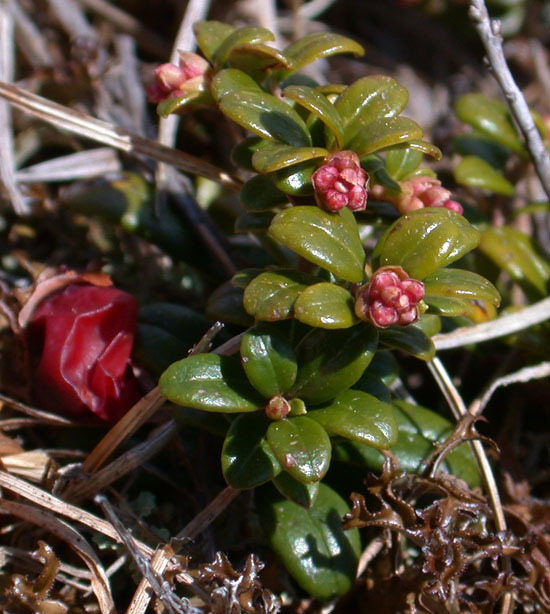 Also in the krummholz and lower alpine zones there were alpine bilberries (Vaccinium uliginosum) just beginning to bloom. Once I reached the summit I hiked down to the Alpine Garden Trail where boulder fields and bedrock were still covered by a bit of snow. The dwarfed and twisted evergreens are likely balsam fir (Abies balsamea) and/or black spruce (Picea mariana). The bit of lavender in the foreground are the flowers of Lapland rosebay (Rhododendron lapponicum) and the creamy white flowers are those of pincushion plant (Diapensia lapponica). 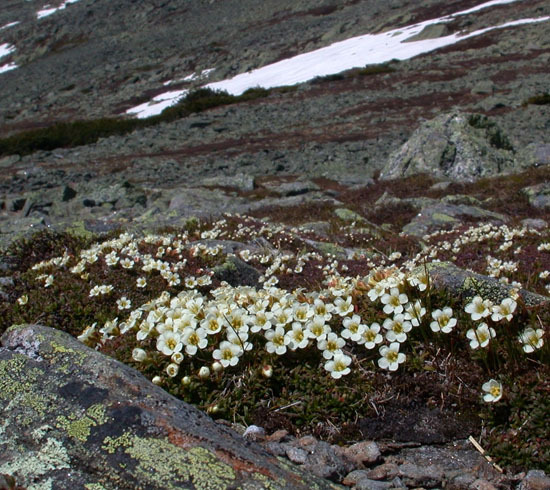 I was able to tentatively identify a few graminoids simply because of their abundance in the alpine zone despite the fact that most had not yet started to flower. 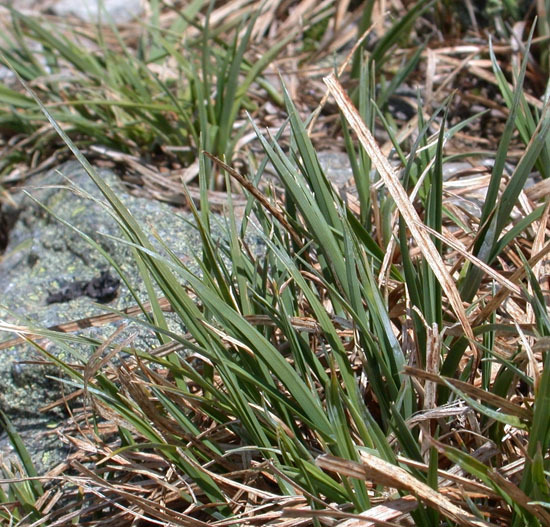 These are likely the leaves of Bigelow’s Sedge (Carex bigelowii). I was able to identify this plant as a rush since some still had fruits from last year. 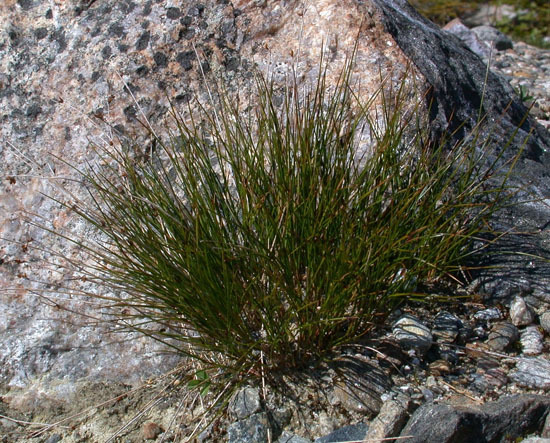 It is probably highland rush (Juncus trifidus) since it was rather abundant in the alpine zone. 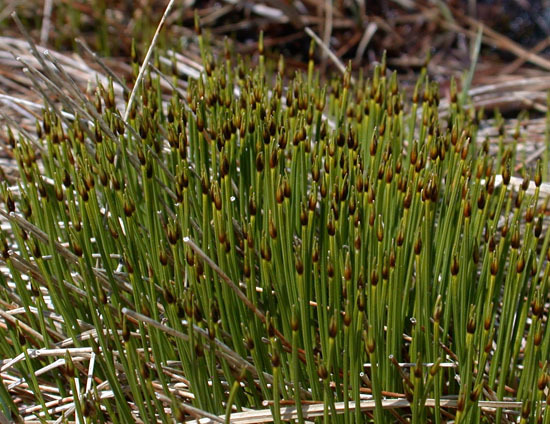 Tufted clubsedge (Trichophorum cespitosum) was the only graminoid close to flowering. The related alpine cotton-grass (Trichophorum alpinum) is occasionally found in rich fens in central NY. There were a few little rivulets running through the alpine zone. 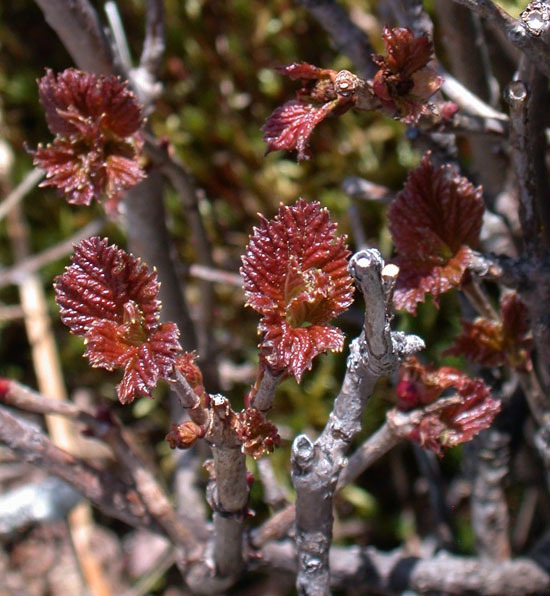 Near one of these the coppery-red leaves of squashberry (Viburnum edule) were just starting to emerge. At least one willow was also associated with the rivulets. I think this one is tea-leaved willow (Salix planifolia) because it has yellowish styles. 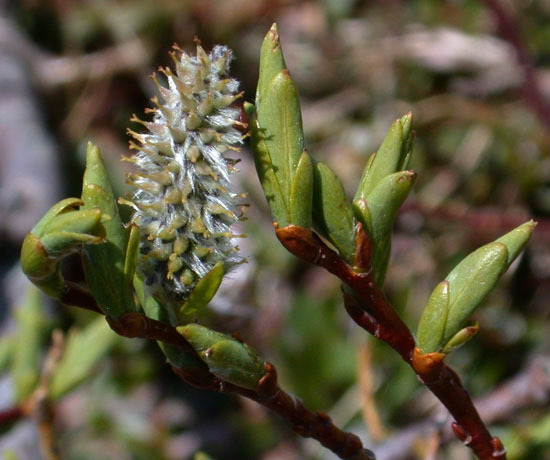 This species is known to hybridize with Labrador willow (S. argyrocarpa) on Mount Washington. 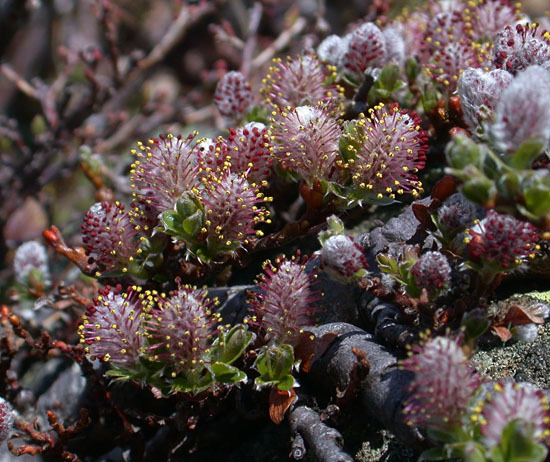 The ground-hugging bearberry willow (Salix uva-ursi) was also blooming in the alpine zone. 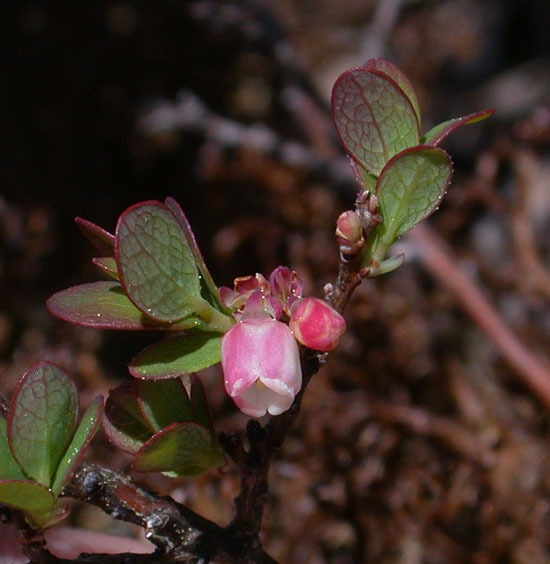 Ligonberry (Vaccinium vitis-idaea) was quite common in the alpine zone. A few plants still had fruit from last year. Some were close to but not quite flowering. 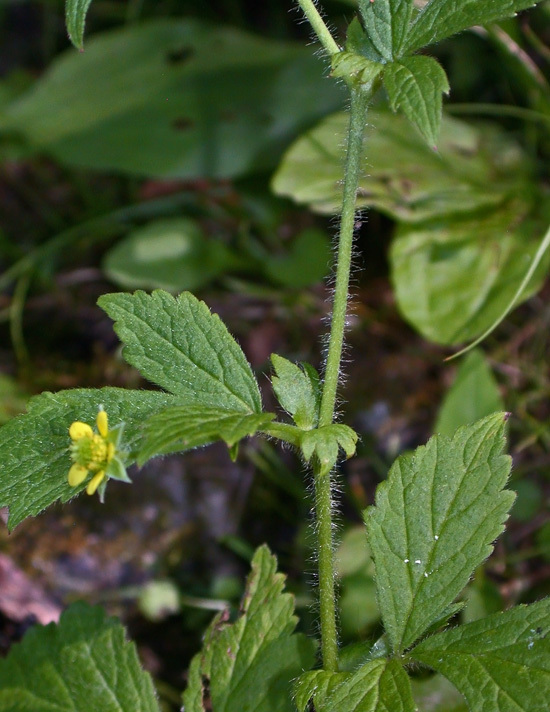 I was also hoping to find the endemic mountain avens (Geum peckii) in bloom but had to settle for leaves and a few immature flower stalks. 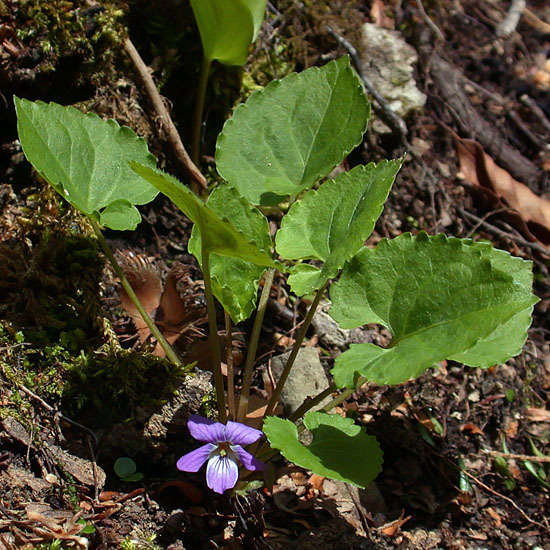 This rare plant is only found in the White Mountains of NH and a few sites in Nova Scotia. 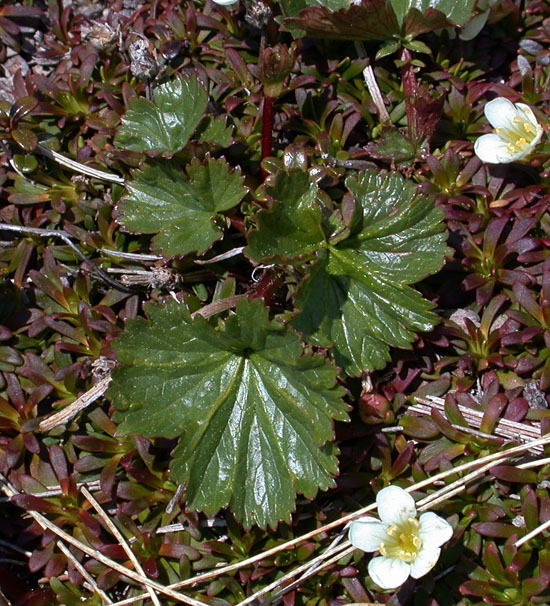 The mountain avens above is growing through a patch of Diapensia. Here is more Diapensia which was in full bloom and quite abundant in the alpine garden. 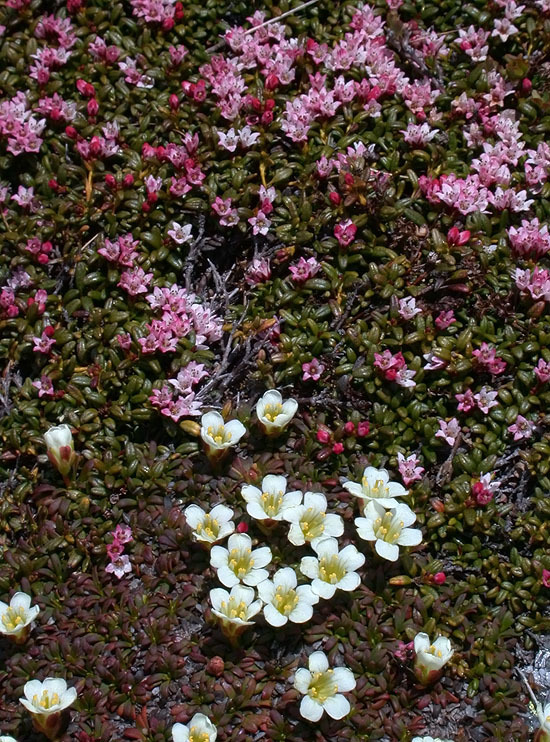 Alpine azalea (Kalmia procumbens) was found growing in close association with Diapensia. The genus Kalmia, named for famed botanist Peter Kalm, includes the mountain laurel (K. latifolia), sheep laurel (K. angustifolia), and bog laurel (K. polifolia). 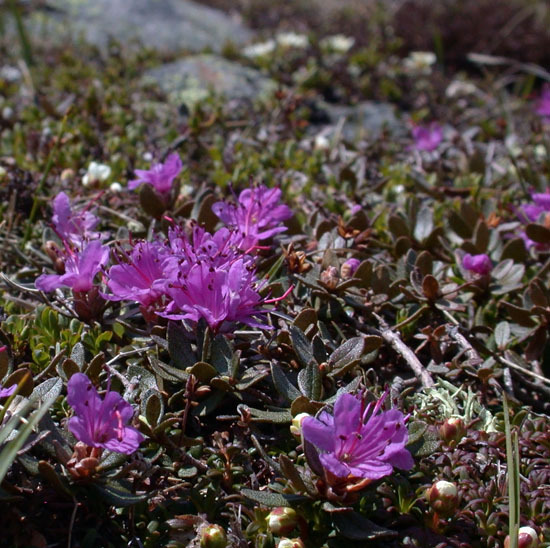 Closeup of the flowers of alpine azalea. The term azalea is typically applied to some members of the genus Rhododendron. Two Rhododendron spp. 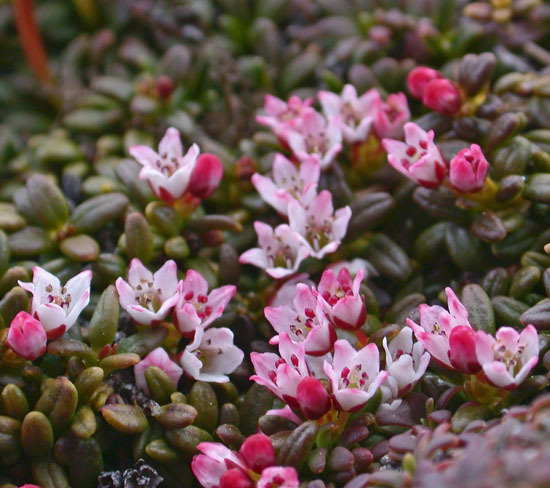 can be found in the alpine zone on Mount Washington, Labrador-tea (R. groenlandicum) which was not blooming yet, and Lapland rosebay which was just starting to bloom when I was there. On my way back down Mount Washington I spotted another Rhododendron growing on a rock outcrop right next to the road. 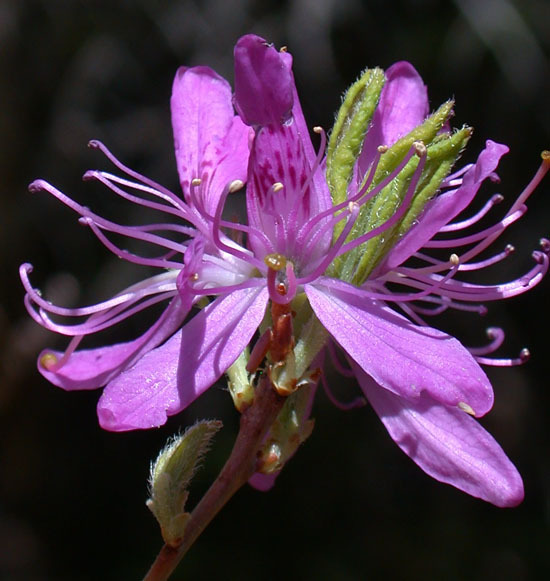 This one was Rhodora (R. canadense). 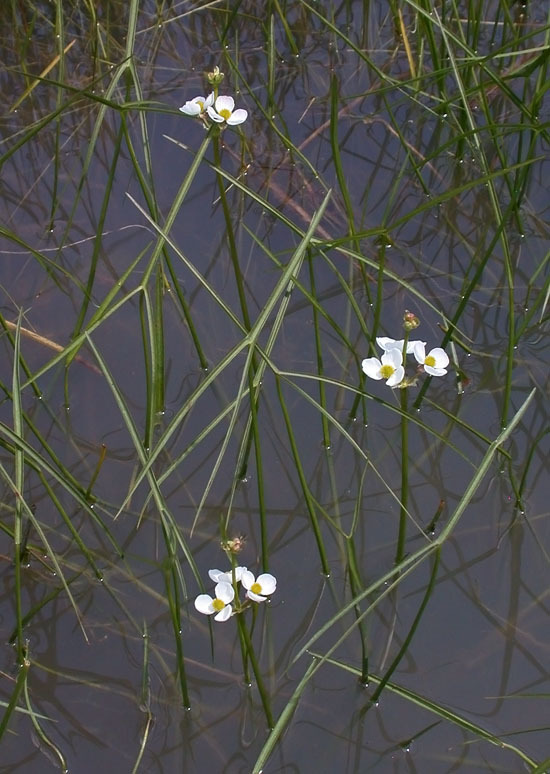 A search of the area turned up a few more plants along a stream and some taller ones growing in a wet meadow.